Soups generally take a while to prepare, but this one is really quick. You could have it on the table in under 45 minutes from starting the preparation. 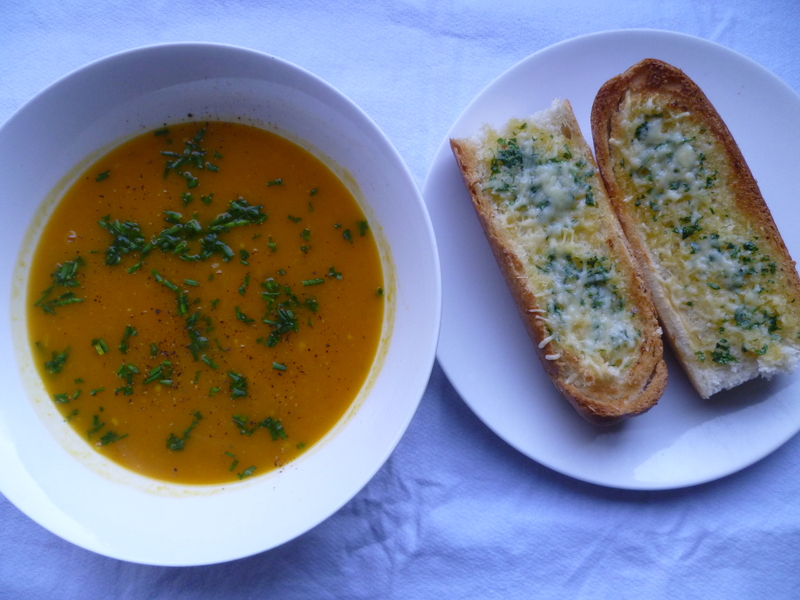 While I prefer my pumpkin soup to have some spice to it, this one is milder and child friendly. Feel free to add some sweet thai chilli sauce to the adults’ if you want a bit of kick. The toasts were a big hit with my girls and are really quick to make. Similar “garlic bread” in the supermarket is really expensive – much cheaper to make your own! 1. Melt butter in a large pot. Add onion and garlic and saute until soft. 2. Add the pumpkin, stock and thyme. Put the lid on and simmer for 20 minutes. 3. While the soup is simmering prepare the garlic butter for the toasts. Mash the softened butter with garlic and parsley. 4. Slice the french stick into 4 chunks, and slice each of these in half horizontally to make 8 big slices of bread. Spread these liberally with the butter and place on an oven tray. Top with the grated parmesan. 5. Once cooked, place the soup in the food processor and pulse until smooth and creamy. 6. Grill the bread until butter and cheese is melted and golden. 7. Serve the soup topped with pepper and chives, with garlic toasts on the side. Hint: One of the most time consuming things in making this soup is preparing and chopping the pumpkin. You could do this the night before, or in the morning, or even in the weekend if you wanted to speed things up on the night you were going to cook this. Just place the pumpkin in an airtight bag and it will be fine for a few days.